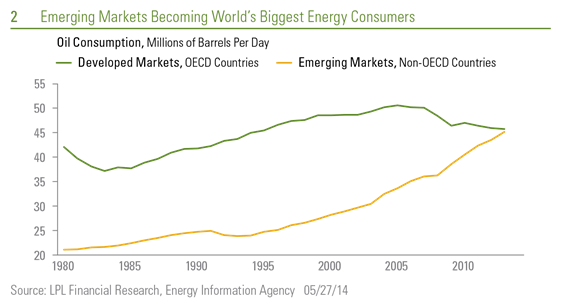 The rise in unconventional oil and natural gas production (oil and natural gas produced through other means than drilling a vertical well) has resulted in fundamental changes to the refining industry. U.S.-based companies have been the biggest beneficiaries. Natural gas is an important input in the refining process. Its relative abundance in the U.S. lowers production costs. In addition, since crude oil cannot be exported, many U.S. refiners have access to oil that is priced at a discount to the oil price frequently quoted in financial media. In the long term, chemical companies should also benefit, as comparatively cheap prices for natural gas and natural gas liquids should lower their cost structure. The U.S. is currently the world’s largest producer of petroleum products, and production levels are growing rapidly – up more than 50% since 2007. This is primarily because U.S. refiners have historically been able to process lower quality crudes than their global competitors. (It should be noted that crude prices may vary depending upon the oil’s quality and where it is produced.) While production is rising, consumption is falling, albeit modestly – down about 10% since the middle of the last decade. As a result, the U.S. has become the world’s largest exporter of petroleum products. While the U.S. is producing more petroleum products, prices at the pump have generally trended higher. The market is global, which is supporting prices, particularly since prices outside the U.S. tend to be higher. At the same time, higher priced global crudes are generally used to set prices for gasoline and other crude oil derivatives. While demand is slowly falling in developed nations such as the U.S., it is increasing in emerging markets like China, India and even Saudi Arabia. The day that emerging market demand surpasses that of developed nations does not seem far away. As noted above, at BWFA we believe the market fundamentals for crude oil and natural gas have changed. We think refiners, chemical companies and businesses that help move crude oil around the U.S. can represent attractive investment opportunities. Our allocation to such businesses (as well as those that are finding and developing unconventional crude oil and natural gas) has increased, benefiting returns. We think this trend can continue.